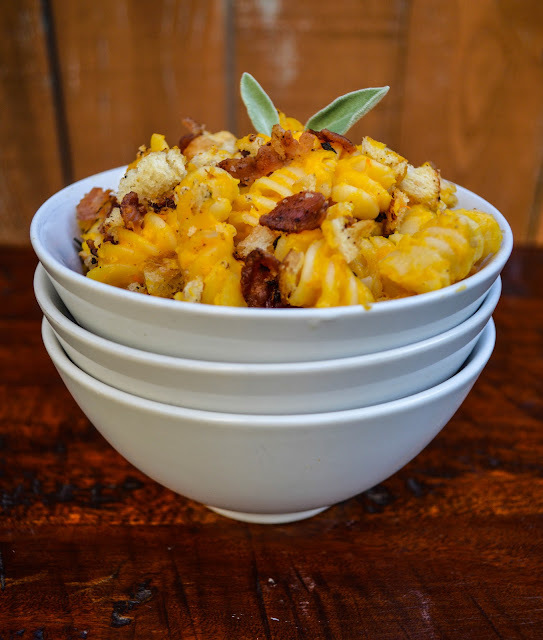 This is a yummy, ooey, gooey version of a classic macaroni and cheese, dolled up with a bit of butternut squash. 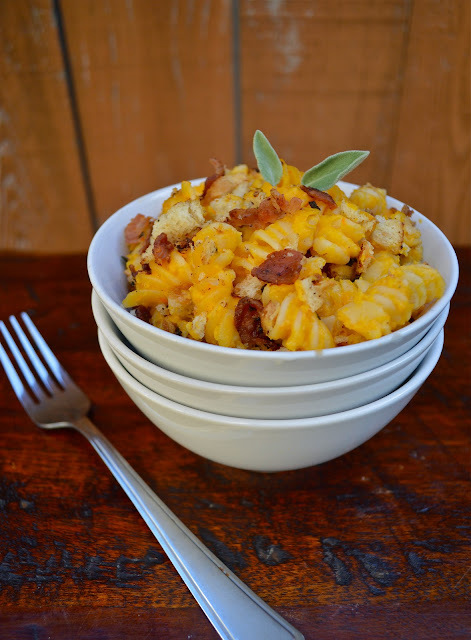 It’s the perfect comfort food for a chilly fall evening with friends and family. While a chill sets in on a wintery evening, let your oven cast a warm glow over the kitchen as this casserole slowly bakes and browns into a gratifying dinner. The pureed roasted squash accents this dish’s vibrant orange hue and adds an earthy creaminess that is quite satisfying. Additionally peppery sage is the perfect compliment to the buttery cheese sauce, smoky bacon and hearty winter squash. In a large pot of salted water, cook pasta about 5 minutes. It should still be very al dente. Drain and set aside. On a sheet pan combine squash, olive oil and salt. Roast for 20-25 minutes; until squash is tender. Set aside to cool slightly. In a food processor blend squash and chicken broth until completely smooth. In a medium saucepan melt butter and add flour while whisking. Cook for 2-3 minutes and then slowly whisk in milk. Add cheese and stir until it is completely melted. Next add butternut squash puree and whisk thoroughly. In a large pot, combine rotini and cheese sauce. 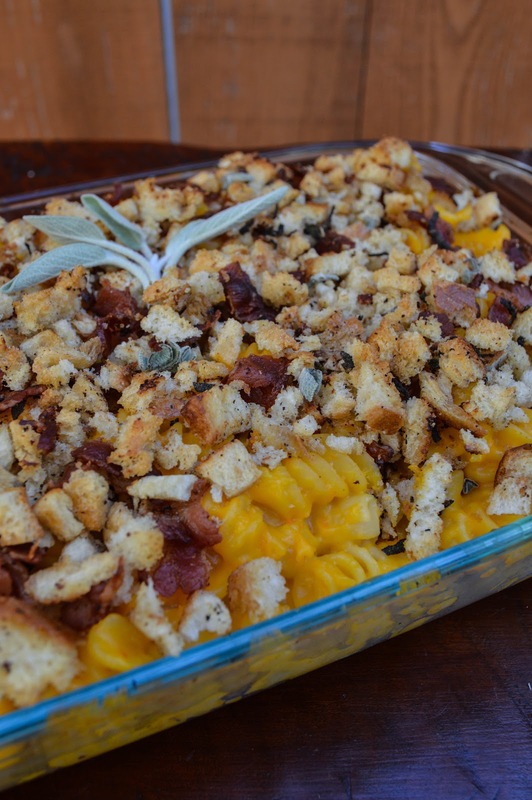 Saute bread crumbs, bacon, sage and olive oil until bread is lightly browned. Sprinkle over rotini. Cover with foil and bake for 15 minutes. Take off foil and let brown for another 5-10 minutes or until sauce is bubbling.